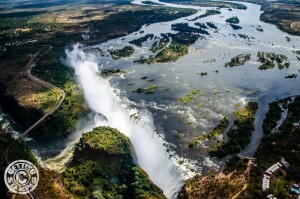 Victoria Falls, Zimbabwe was high on our list of places to visit once we booked our Africa overland trip. 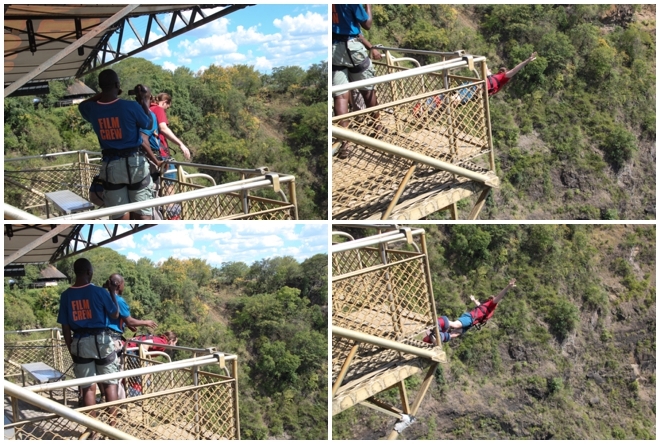 Mostly because bungee jumping off the Victoria Falls bridge was on Matt’s RTW Bucket List! Once we entered the city on the overnight sleeper train from Bulawayo (not a pleasant experience), reality hit. WE ARE ABOUT TO JUMP OFF A BRIDGE. 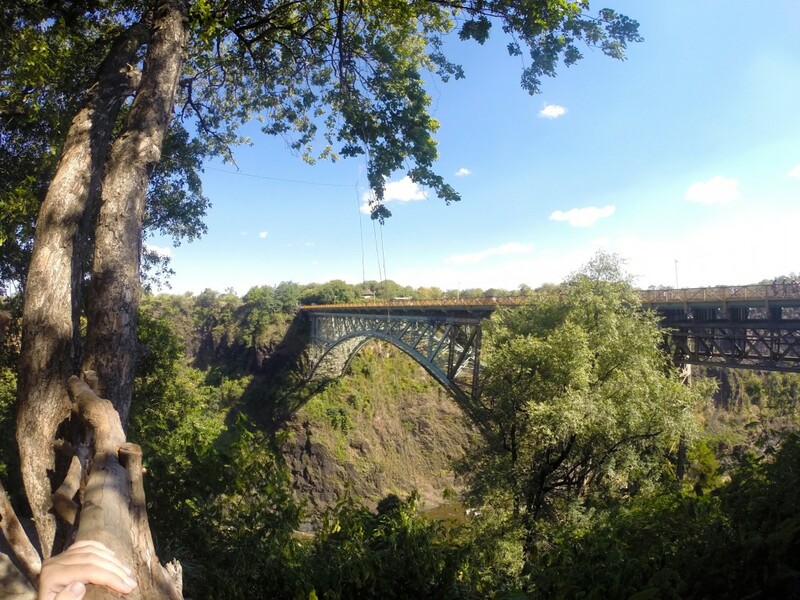 The Victoria Falls bridge measures 111 meters or almost 365 feet high. That is roughly the same distance as a 34 story building! We sat through a short presentation about the different adventure activities offered and decided on a package called the Big Air Combo. That made it official, we were both jumping off the bridge. And not just once, but the package meant we were going to be throwing ourselves off twice! 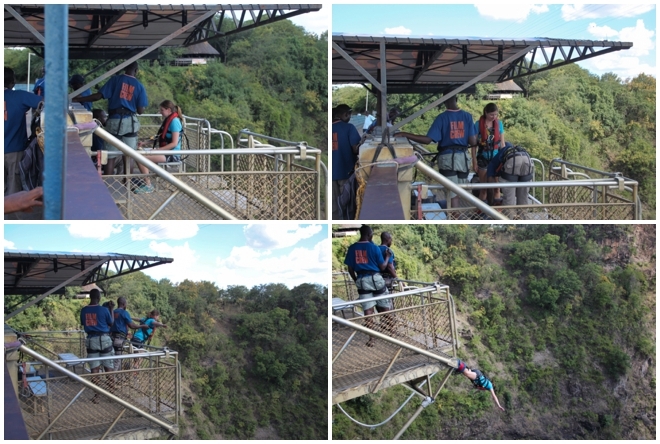 Along with the traditional solo bungee jump, a couples bungee swing and a zip line were included. I wanted to go as big as possible, so I tried to really spring out and swan dive down. It was an amazing rush and a feeling I’ll never forget. Luckily a fellow passenger on our overland truck had a GoPro chest strap, so I was able to get some video of what I was seeing and relive my jump. It gives me a knot in my stomach just watching it! Check out the view of the jump below! 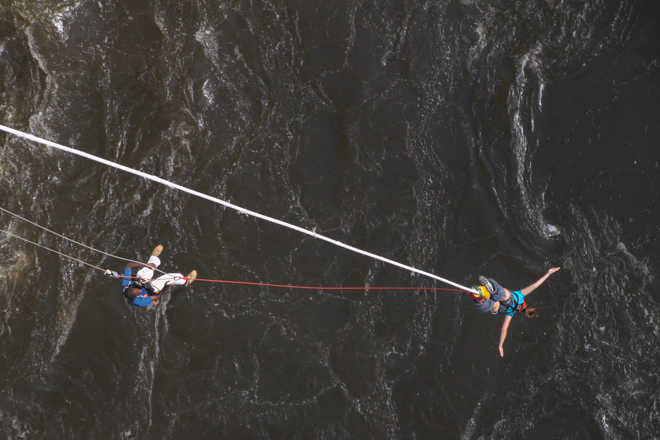 Oh, if you think the traditional bungee jump is scary, try a couples bridge swing! It was a complete disaster based on not following instructions (cough, Alana, cough), but we had a lot of laughs once we got our feet planted firmly back on the ground. While in Victoria Falls, we also needed to see the falls up close. We decided to go to Victoria Falls National Park. 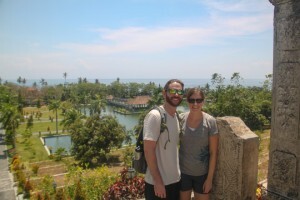 It costs $30 USD per person, but it was well worth the money in terms of the spectacular views and beauty. There is a path set with 17 different viewpoints of the falls…and be aware, you will get wet. Luckily we were told of this in advance, so we wore the proper clothes and only brought our waterproof GoPro. 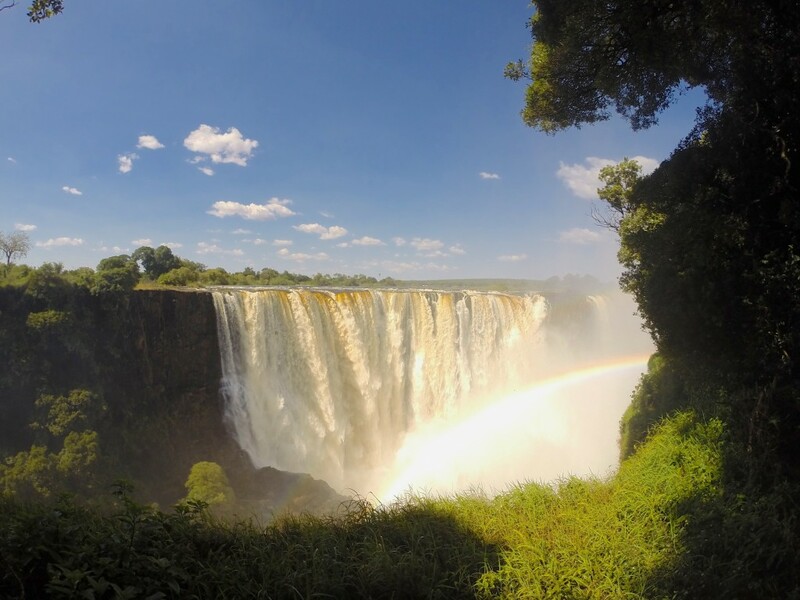 Victoria Falls offers some other fun experiences beyond walking the falls and jumping off bridges. After you walk the falls, you’ll be tempted to check them out from different vantage points. 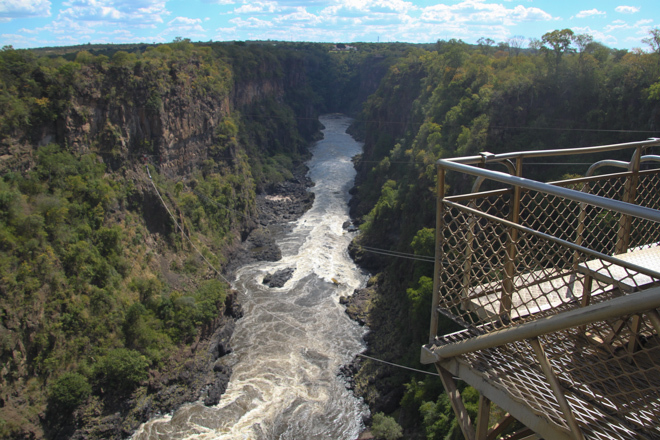 A few optional excursions where you can view the falls are going to the Devil’s Pool or taking a micro flight or helicopter ride over the falls. Unfortunately for us, Devil’s Pool was closed due to high water during our time there, so we weren’t able to check it out (totally bummed). We also passed on the different rides over the falls, but the pictures and videos we have seen look amazing! Our friends Adam and Hannah over at Getting Stamped have a great post on their helicopter experience here. 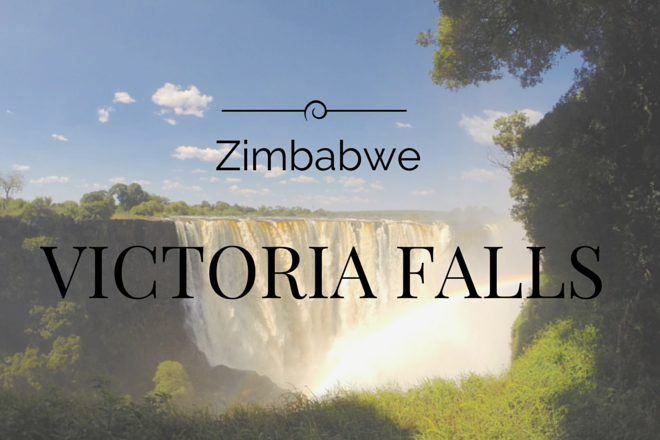 Lastly, the Victoria Falls Hotel is a classic colonial style hotel built in 1904, which offers a wonderful afternoon High Tea with a view. For $15 USD per person, you can enjoy as many tea or coffee drinks as you’d like along with a hearty plate of food and desserts. The plate could easily be enough for two, but everyone gets their own…so come hungry! 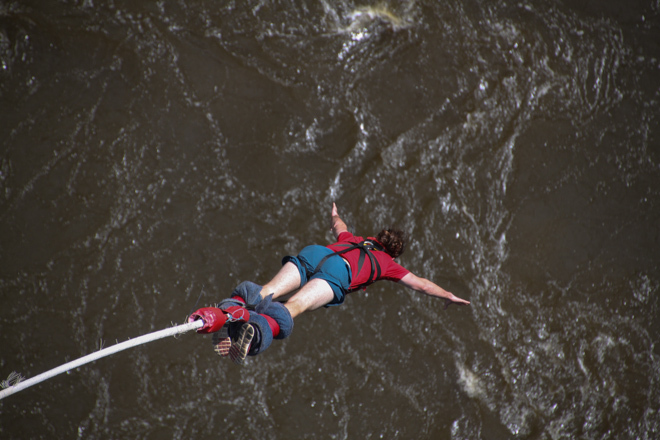 Have you ever bungee jumped? If not, do you think you could do it? You two are brave! The jump looked exciting…but not on my bucket list!